I'm making good progress on my Knight. I thought I might share what I have so far. It took me a while to get started on this guy, but now that I'm making progress, I'm really getting into painting him. I guess I'm about halfway done at this point and should be able to finish him off in the next few nights. I've got some detailing to do and all his iconography to add. I'm thinking I'll make the image fairly complex to offset the simple paint scheme I used. 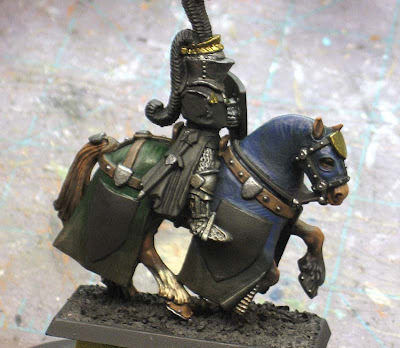 The horse's colors are quartered (blue and green), just like the Knight would be except he now wears black to symbolize being part of a bigger crusade. He would normally wear his own colors but an undertaking such as this does not permit him to. I just made all that up right now... on the spot. Actually, I should be able to get him done on time. I know the deadline is coming up soon, sometime around the end of January I think and I don't want to be late shipping this guy off. Ron, he is looking good. I finished my Knight last night and he is going out in the mail today! I am looking forward to seeing your final product. Meatball: I should be able to get him done this weekend if all goes according to plan. I'll defintely post pics of the finished model too. Looking good, I will update the picture in the new post.